If his handful of delectable, slow-burning house and disco 12″s from the past few years were just Milo Johnson flexing his chops again after a lengthy studio absence, then his 2012 debut long player, Return of the Savage, was his proclamation of having assumed mastery over his studio. Having originally been a pivotal part of Britain’s sound system culture in the 1980s, Johnson relocated to New York at the tail end of the decade and soon after began releasing raw, underground house as Nature Boy. After a run of half a dozen EPs and a compilation of his earliest work, his output halted abruptly and it would take almost 20 years before we heard from him again. When he returned it was as DJ Nature, and the sluggish, hypnotic disco cuts which found a home on Golf Channel Recordings left no doubt that he had unfinished business. Little White Earbuds tracked down Johnson to quiz him about his approach to recording, to find out what he was up to during his musical hiatus and to see what he has in store for us next. 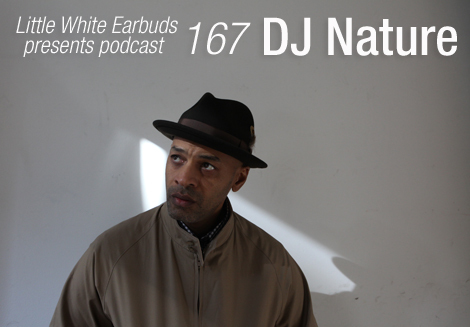 He also mixed our 167th exclusive podcast; a hugely enjoyable collection of deep house and affiliated business with a few eclectic diversions thrown in for good measure. You were releasing as Nature Boy in the early part of the 90s before coming back as DJ Nature. What were the reasons for the changes and what does each name represent for you? Milo Johnson: Well the change was a natural progression, really. Back then I was just a boy in that industry; today I have two kids in college so it’s bit nuts trying to call yourself “Nature Boy” at this point in time. The names don’t really represent anything but making what I like from a natural standpoint rather than a popular one. What was it that got you back into the studio after a break? Timing really. I no longer had the restrictions on my time that I had before with my kids; they are a lot more independent now and that freed up time for myself. Prior to this it was always really more of a means of expression rather than a business, so I had to juggle a regular job with my “creative” needs! In the time I took off I was able to buy and integrate new equipment into my set up and learn it a lot better than the really basic stuff I did the first batch of releases with. You’re originally from England but moved to America some time ago. What were the reasons for the move, and how did the land of the free compare to Margaret Thatcher’s Britain? At the time I moved which was in 1989, I was given the offer of distributing records and clothing to Japan. When that offer came up it really made a lot of sense to what I wanted to do within my creative goals. I thought it would be much easier to do my own thing and release records by myself, even if it only meant me pressing 500 or 1,000 12’s, that was fine by me. That was all I really wanted to do, but even that relatively small number would be impossible to move at that time in the UK. So it all kind of made sense in that way. When did you start working on the tracks that would become Return of the Savage? I think I started working on that around the middle or early 2011. It was finished by November of that year but we ran into some issues with the original pressing and it knocked everything back big time. I see on the credits of the album there are credits to various musicians — keys, horns etc. To what extent was the album recorded material and sampled/programmed? There are a lot of samples of course, to what extent in terms of percentage I don’t know. Then I recorded and arranged everything at home and took those tracks to my mate Fred McFarlane’s studio to record the solos. I then took that back to my studio to mix and arrange and make whatever changes I needed. Had you worked with musicians on your productions in the past? Did this open things up for you in terms of where you could take things? I worked with the same musicians on various tracks on the earlier DJ Nature project. I just find those guys the best to work with. Really easy going and open minded, plus I am really fussy about the feel of what a soloist does. Whenever I make a track I always do so with the intention of having a soloist on them at some point. Sometimes the track doesn’t need them, as I may have enough vocal samples to fill up the track. But good vocal samples are like gold dust these days. It is incredibly exciting to see how a soloist transforms my creation though and with the guys I use they just never fail to blow me away. There is a rawness to the album that feels like it owes as much to the cut’n’paste aesthetic of the Bomb Squad as it does to house music. Would you say that hip hop informs your music as much as house does? Bomb Squad? You mean the Public Enemy guys? Those guys were revolutionary! Never stopped listening to that stuff. I guess I see some of the similarities to an extent, maybe early Bomb Squad stuff, but not It Takes a Nation of Millions… so much though, that stuff is just untouchable in my eyes! I take most of my inspiration from older production teams such as Pat Adams, Chic Organization, of course Philly stuff. Without question Joe Gibbs, early Scratch Perry and also that Young Senators ruggedness. That’s what I have been listening to constantly over most of my life anyway, that and loads of other bits! But I want to say that I don’t sit down and say, “Right, I’m going to make a track like these guys.” I come to the conclusion from me listening back to some of my efforts, I find it more of a subconscious inspiration. When I was younger I loved the whole idea of jazz fusion, be it with disco or rock. That whole concept is what I am really driven towards. The blending of certain “non-related” elements is the essence of forward thinking creativity in my opinion. Does it feel weird that 20 years after you started releasing as Nature Boy there is this current fascination with 90’s house? I don’t so much think it’s weird. I understand the allure of that era, because it was the golden age of the genre. Luckily for me I was a buyer for a store back then so I have a pretty good collection of that era of house music especially. Musically what is inspiring you at the moment? Well not that are so much inspiring, but there are certain artists that I think are on the next level in terms of production. Guys like Pepe Bradock, STL, Lawrence, Deepchord, CV313, Bulgari — those guys I don’t have to listen to what’s new from them, I just buy it because they are consistently great. Funny thing is I rarely get chance to play a lot of that stuff out live. I just do myself mixes for long drives and totally immerse myself in their incredible talents. I understand you have teenage sons who are DJs. Did they get into doing it through you? Is there a generational gap in the appreciation of certain types of music between you? It’s a bit of along story really, but we went for a holiday in Japan when they were a lot younger and I played a small beach gig for some friends during the day. It was the first time they saw me in that way as a performer so to speak and I didn’t actually tell them what I did other than make music sometimes. So I think they were a bit shocked how people reacted towards me during and after my set. Anyway, I think that kind of set the ball rolling for them. You know as a father you always want your kids to be better than you are and advance your bloodline, so I was afraid they would get into this music and let it consume their life when they should be reaching for higher! Can you see yourself producing with them? It would be nice, but they are pretty independent kids! They want their own identity which I can totally relate to and they do their own thing. They are only just asking me some technical advice in terms of production which makes me feel good! But I let them have their space to find their own way for the most part. The majority of your newer releases have been on the Golf Channel label. How did that come about? I was introduced to Phil South by a mutual friend and we did a couple of parties together for his No Ordinary Monkey event. He said a while back that he was getting a label together and if I had any new material, or even old stuff that never got released, he would be up for putting it out. So I said when I get something together I’ll get it to him. Nothing much to say about the mix, just hope you hear something on it that moves you to buy something independent. What can we expect from DJ Nature over the next year? I am hoping to put out a box set with myself, Gimme 5 store (London), and Golf Channel. I’ve got a collaboration with another artist that is yet to be titled, and four new tracks for Jazzy Sport that will go on an album of previously released material I did with them. I work really slow so my work load has to be limited I’m afraid. I’m not the most organized person either; a million ideas and a hundred partially done projects going at once. Not good! podcast of the year so far! Stellar mix, can’t stop listening. The mix from Debukas into NY*AK is heart-melting.